There is something about an open face hot sandwich that I absolutely love. I couldn't really tell you exactly what it is though. One day when playing around on the Williams Sonoma web-Site I decided to gander through the recipes, which is a pretty frequent occurrence, might I add. 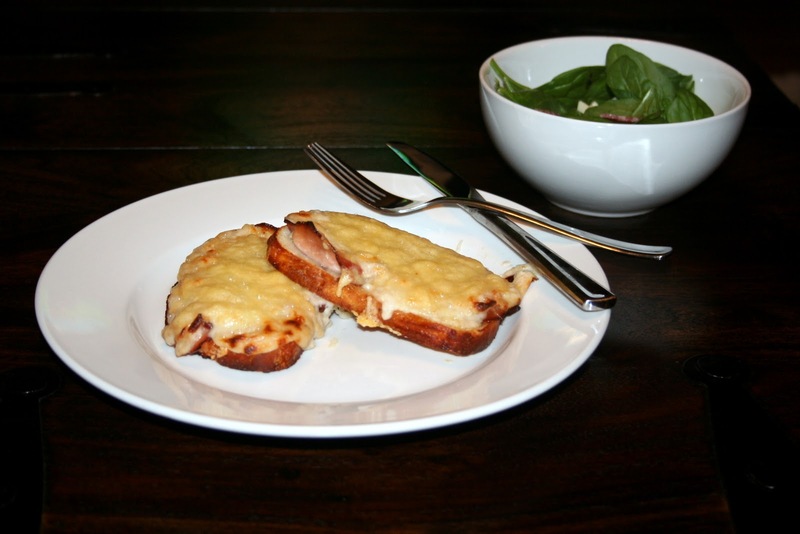 Anyway, I had a hankering for a sandwich and was looking through their sandwich recipes and landed on this one for an Open Face Croque-Monsieur. A traditional Croque-Monsieur is basically a fancy grilled ham & cheese sandwich but on steroids because it has a creamy delicious bechamel sauce layered in as well. Many people also love the Croque-Madame version - a Croque-Monsieur topped with a fried egg. After falling in love with the idea of this sandwich I decided that I needed to add it to our menu and stat! The great thing about this sandwich is that it's easily adaptable to how many people you need to serve. I ended up making this sandwich one night when my husband was in work meetings and wouldn't be home until after dinner. No problem for my menu planning because all I needed was to scale down the recipe. Easy as pie! This along with a quick simple salad or soup and you've got a fantastic quick lunch or dinner. Position a rack in the lower third of an oven and preheat to 450 degrees F.
To make the bechamel, in a 2-qt. saucepan over low hear, melt the butter. Whisk in the flour until smooth and cook, whisking constantly until the mixture smells nutty and fragrant, about 1 minute. Slowly add the hot milk, whisking constantly until the mixture is smooth and lump-free. Season with salt, pepper and nutmeg. Increase the heat to medium and bring to a simmer and cook, stirring occasionally, until the sauce is thickened, about 5 minutes. Reduce the heat to low and keep warm. To assemble the sandwiches, lightly butter a baking sheet. Place the bread slices on the sheet and layer the ham even on the bread. For each sandwich, spread 1-2 tablespoons of the bechamel over the ham, or as desired. Sprinkle the cheese even over the bechamel. Bake until the cheese melts and evenly browns, and the bread is golden and crisp on the bottom, 12-15 minutes. Serve immediately.